Now settled into the sleepy Yorkshire village of Darrowby, and married to Helen the farmer's daughter, James Herriot thinks he's finally got himself sorted. But life as a vet in the 1930s was never going to be easy. Quite aside from his unpredictable colleagues, brothers Siegfried and Tristan Farnon, he must contend with new-fangled medical techniques, delivering calves after far too much home-made wine, and a grudge-holding dog called Magnus who never forgets. And then, with Britain on the verge of war, James faces a decision that could separate him from Darrowby - and Helen - for ever . . . Since they were first published, James Herriot's memoirs have sold millions of copies and entranced generations of animal lovers. Charming, funny and touching, All Things Bright and Beautiful is a heart-warming story of determination, love and companionship from one of Britain's best-loved authors. This omnibus edition comprises the majority of chapters from Let Sleeping Vets Lie and Vets in Harness. 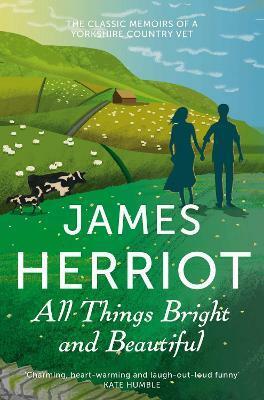 James Herriot grew up in Glasgow and qualified as a veterinary surgeon at Glasgow Veterinary College. Shortly afterwards he took up a position as an assistant in a North Yorkshire practice where he remained, with the exception of his wartime service in the RAF, until his death in 1995. He wrote many books about Yorkshire country life, including some for children, but he is best known for his memoirs, beginning with If Only They Could Talk. The books were televised in the enormously popular series All Creatures Great and Small.